Inspiring Jibberjabber: November is Gone....sigh! Proof that November was full of smiles! It doesn't get much happier than this! November has been a month of busy-ness. It seems like it's been a whirlwind from the first day. The big news this month is....we got a new addition to our family. 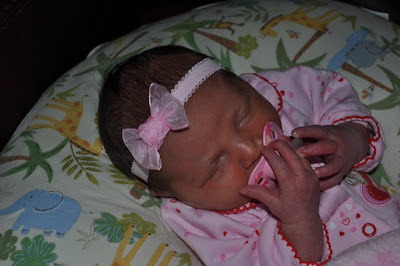 My new little niece...isn't she presh? She was born on the 18th. Thanksgiving came and went. We had much to be thankful for...and lots of family and food. Our new littlest family member made it just in time for the food! We gathered with my family and enjoyed a cold, rainy day of fun and fellowship. These pics were taken earlier in the month as we got dressed for church. Millie actually posed for these! Miracle! Never ask a 20 month old, "What's that in your mouth?" Because she will show you! In this case it was fruit loops, not too bad. Crackers or chocolate...not so fun. Millie's First Pony tail..her hair is getting thicker. One of these days, we'll have pigtails...I'm sure of it! If I could just keep her out of the dryer...I'm sure they make baby locks for those things. Ahhhh! What will she think of next. Jellyfish has been working hard at school. I sat down and rechecked his progress in our curriculum to see if we would meet our goals before Christmas break. There's always good and bad news there. We are finishing our Christian Kids Explore Biology book (as planned) and I'm trying to figure out where to go in the new year. Jellyfish wants to do Chemistry. CAN YOU BELIEVE THAT? He wants to do Chemistry! Is this my child? He definitely gets that from his Daddy, the Science teacher. I have to say the Christian Kids Explore Biology book was quite interesting. I will be writing a review on it soon...there are definitely pros and cons. I am trying to decide whether to stick with the series or try a new one. Soooooooo, we delved into December with long shopping lists, 3 weeks of school left til break, and my husband's foot surgery looming on the 20th (yes, I know, that's 5 days before Christmas).